NPR has a nice short piece on Find A Grave, a one-man operation founded in 1995 fueled by an interest in famous persons’ graves that has become a full-on crowd-sourced enterprise for finding anybody’s headstone worldwide, famous or not. People can request photos of graves in faraway places and volunteers in the area will hunt it down, snap a shot and upload it to the site. 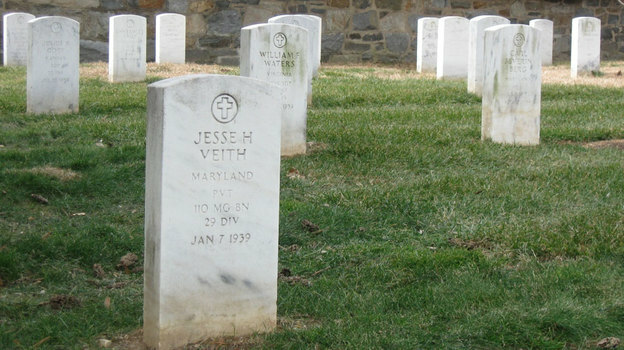 Lauren Silverman goes to Arlington National Cemetery with one such volunteer, Anne Cady, on behalf of Teddi Smith in Florida, who is looking for her cousin Jesse Veitch, a WWI veteran. Posted by Meg Holle in Cemeteries, Death + the Web and tagged genealogy, grave markers. Bookmark the permalink. This is my horror story on the memorial for my Uncle who died in WWII that I created for him. decided to do a random search for my Uncle and found a duplicate and that was when things went wrong. This other memorial was created before mine but however I had accurate and complete information and paid to sponsor the memorial. The gut that entered the other memorial had gone to the American Battle Monuments web page and just started entering them into find a grave. This person entered all of the crew that flew with my Uncle except for one. He did not research them or care that he had incomplete and accurate information. So I started sending him suggestions to correct them and when I came across my uncles I requested ownership of it and he refused saying that I was not “immediate family” even though I told him the memorial was for my Uncle. This was when I got Admin of find a grave involved and the transferred the duplicate to me and once I received it I proceeded to delete it, at the time I was not aware that I was not supposed to do that. But I did that because I had complete accurate and developed memorial that I had paid to sponsor, and the creator of the other memorial decided to insult me by saying I was not immediate family. This allowed the creator of the other memorial for my Uncle to say that Uncle and nephews were not included in immediate family, when in fact immediate family in the dictionary does include Aunts, Uncles , nieces and nephews. So when they resurrected the memorial that I deleted they merged the memorial that I developed and sponsored with the memorial that the other person created and deleted all of my information. So I deleted it again. Well by this time the other contributor had gotten the admin to agree with him that I was not “immediate family” and resurrected it again but removed me from ownership. So I deleted all of the flowers and pictures from the memorial that I contributed. I had to get my 87 year old father involved, creating and account for him and had him create the ownership of the memorial which the creator proceeded to deny. So we had the admins transfer it again to my father. We had to agree not to delete it. Which we agreed not to delete the particular FAG memorial number that he created. back. but with no information except for the message that we did not authorize the that memorial. Now the creator is complaining again and is threatening me and my father with banishment from FAG. My father and I feel that we have lost control over my uncles information and feel hounded and harassed by this other contributor now. The people behind Fin d A Grave are all about Burials and Grave sites of Famous people, the paparazzi of the famous and notable dead. Genealogy and accuracy takes a back seat to this for them. When you flag a memorial as famous you loose all control over the memorial and it becomes the property of Find A Grave. This is a Warning of a concerned contributor to find a grave. Sorry to hear you had such a frustrating experience, Ash. Great story about the good side of Find A Grave. Unfortunately, there are so many problems with what Find A Grave is doing. I work at a small non-profit organization that has been collecting cemetery data for our county for the past 20+ years. Now we find that the information that we published and copyrighted into books is being added to the Find A Grave website without our consent. If what Find A Grave did was help people connect with family members and make requests for volunteers to take a photograph of particular grave markers we would be willing to recommend the site. However, just allowing data (and other peoples data for that matter) without pictures is not what the site is or should be about. OMG…and here I thought I was the only one having a problem! I haven’t been on the site all that long, but I have been very active. I had over 300 memorials added, including a lot of the alumni from my high school, as I also run an alumni site for the school. I had linked a lot of the deceased classmates to memorials I had created on FindAGrave. And btw, I hate the initials ***…I think it’s very offensive. When I brought it up in the forums, I was bombarded with hate posts. So now, I created a memorial for actor Steve Landesberg, who passed away the other day. A female came along (katzizkidz) who posted a photo of the actor on my memorial. Ok…fine. It was a terrible photo of him, but there was nothing I could do about that. The next morning I get up and she’s removed the photo and created her own memorial for the actor. A third memorial was created later in the day. Now it’s my understanding that the administrators loathe duplicate memorials. The rules state that you’re supposed to do a search before adding a memorial and if one exists, you’re to work with the creator of that memorial and not create a new one. So I contact this woman who proceeds to belittle me and tell me that it’s up to the mods to make the decision. I sent her the rules, but she didn’t care. So I reported her to the admins. Next thing I know, there’s only one memorial for the actor and they’ve given the credit to the woman who created the dupe memorial! I then received a very obnoxious email from Robert Edwards (bobnoxious) stating that she was fully in her right to create the memorial, but offered no explanation as to why and never addressed the fact that she broke the rules. So, I write back and ask him about it. I also state that I think the rules seem to be arbitrary, that we’re dealing with archiving memorials and not nominations for the nobel peace prize. He then writes back telling me I’ve been banned from the site! So I go in and look and sure enough, I can’t access anything. So I look up my family memorials that I had added….they’re all gone! The over 300 memorials I had added (that are linked to on my alumni site) are GONE! They deleted them all! I’ve sat here every morning for the last two months entering obituaries from the papers. I’ve driven to several different cemeteries and taken volunteer photos for people who have requested photos of their family’s headstones. And now all my work, all that time I spent is down the drain. I think it’s a GREAT site and a great service for genealogists. But if this is how the owner and administrators think it’s appropriate to behave, they need to be taken down. @ash: If only people would read FAQ’s before diving into a site like this. It don’t matter that your memorial had more info or that you paid for it. It’s still one memorial per person. It’s hard enough to get volunteers but if people like you keep deleting originals so your name can be on it it’ll be impossible. I’m surprised you weren’t immediately banned. So it’s been merged. It should say created by the original volunteer & managed by your father. So then you can edit it however you feel (except delete it). That’s what management is all about. Add the correct full name, dates, locations, bio, links, etc. It is your uncle’s memorial after all. Why would you leave it sitting there stating you all didn’t authorize that memorial? That’s a lil disrespectful to your uncle & also any relatives searching. It also makes it seem like you’ve still got a duplicate floating around…which they will find eventually. It also makes it seem like you may just delete the original again. If you read the FAQ’s it says it’s not a genealogy site. You can add a bunch of info & you can link them. If people are willing to edit & link then once it’s done it’s done & there’s no real reason to transfer them around from person to person. People deleting originals is one of the reasons people don’t like to transfer. I’m afraid between the complaining & the deleting they may drop this family thing entirely. You won’t even be able to get your own parents or kids. My family has a website and I made a multi-page memorial for my father there after he died. Someone copied the main page plus my father’s photograph to FindAGrave. The part of the page for people who knew my dad to contact our family, well that part wasn’t copied over. No one notified me of the copying even though the contact info is right there on the page. 1. When people Google my father they should see a listing of our family page, not the copycat page at Findagrave. 2. When Dad’s friends want to reach us they should be able to find the contact info with his memorial. 3. Copy/pasting this kind of material is actually a violation of USA and international copyright laws. 4. Findagrave is such a hideous-looking money machine! Look at the homepage! This site is about running banner ads. They have a little apologetic blurb about it but we all know you can sign up for text ads that match your content. You don’t HAVE to run obnoxious ads on a site. Clearly the site’s purpose is to copy data from other places and then try to make money off of that. 5. Dad was cremated, there’s no grave that anyone is trying to “find”; obviously Findagrave expanded their site to nongrave searches just so they could copy more stuff, get more visitors, and therefore get more banner views and make more money. I wrote to Findagrave and told them to delete my father’s material and they did. But I’m still angry. Disrespectful graverobbers. I urge everyone to contact & file a complaint with the Better Business Bureau. Also keep posting FAG horror stories online. This site is run by a bunch of unfair admins that only care about # of memorials added like it means anything. Jim Tipton makes lots of money off of his admin cronies copying other people’s work. They put up memorials of people still liviing in additional to young children recently deceased. Their parents don’t even get a chance to mourn before their young child’s memorial is oline for the whole world to stare at and keep opening the gaping wounds of mourning. Do not think you are doing a service to these people by voluntarily putting up info becuase the minute the admins have it in for you they will delete all your hard work without warning. Usually without just cause. If run properly the site would be great. Unfortunately its run by Jim Tipton. In response to Kathy about the “copyright” of the information in the cemetery book. Facts such as dates of birth and death and where someone is buried are not copyrightable. Your group may have been utilizing the information and making money for your non-profit organization, but that does not preclude other people from using these facts for a site like Find A Grave, especially since the volunteers are not making money off your work. If your data is strictly “facts” such as these, you have no copyright on those facts. if you contribute to this website you are gambling the probability of wasting your time. I was there for nearly 5 years they deleted over 6,000 edited photos i took for other people. Administrators are nothing more then other volunteers with no experience in resolution and demonstrate their lacking skills in the hundreds of people who are being banned from the site. Administrators will violate the rules for self serving interests and people who are competing for numbers. Which is the other problem those who compete for numbers are copying other peoples work who created an online index they copy death indexes and obituaries. 95 % of what they add does not go in to a cemetery. One gal recently told me she adds names to random cemeteries for the purpose of competing. What a bunch of whiners! Drivel is what this is. F.A.G. is about documenting graves. As a genealogist and member I have been just appalled at the dirty, rotten, low down, disgusting vile behavior of so called adults over virtual memorials! Name calling, freaking out because you cannot control every single member of your family. And how and why would you contact the better business bureau? Did you purchase anything? No. You may have “sponsored” a page but no one makes you pull out your credit card. Hi, folks. Due to this post constantly being brought back from the dead, rife with renewed internet nastiness, I am closing the comments.